GIFT AN ADVENTURE TO A CHILD THIS SUMMER! campers from our division, which is the highest total in many years; we served 40,740 meals; 527 campers came to accept Christ for the first time or recommitted their lives; this was all accomplished over a 7 week span this summer. This was a great summer for us at Camp Mt. Crags, Gilmore and Wilderness. I am grateful for a wonderful staff and team for making this summer such a seamless operation. As we look forward to providing a fun, safe, and God centered environment for our campers next summer, my hope is that you would join us in making that a reality for children and youth who have yet to experience the wonder and magnificence of God’s love at our camps. Your contribution helps us to increase the number of campers we serve each summer. Jasmine is currently a Junior Soldier of our South LA Corps. She also attends our after-school program, is a Sunbeam in our Troops program, and attends both the English & Spanish worship services every week. She is one badge away from being a Commissioner Sunbeam. them there having fun with us, leading some of our free time activities, and even being silly during campfire time. I really enjoyed having leaders there that I knew already from the center. I can’t wait to go again next year to make more new friends, and try more new experiences that I wouldn’t normally get to do or see, like the creek at camp. attend church, but for some campers we don’t have the opportunity to follow up until next summer. So we were especially thankful to have run into Monica and have her share her camp experience with us. It was a beautiful reminder that are campers ARE everywhere. Many campers who once rode a big yellow bus through Tapia Park to camp are now much older and we hope that you will remember camp and share your stories with The Campfire. And with almost 80 years of summer camp history, we are proud to say that this past summer we had the honor of serving almost 2000 kids. We invite you to continue to be a part of camp’s legacy of changing lives. What a blessing. What a privilege. What a legacy. Absolutely thankful for what God continues to do at camp. And to all the camp kids everywhere, young and old...thank you too! A TEAM THAT GOES TO CAMP TOGETHER The Siemon Community Center of South Los Angeles staff members spent a week at camp with their campers to increase the impact on changing the lives of their community center members. services at the corps community center with what they were experiencing at camp. I also had the pleasure to just hang out with the kids, and participate alongside them in all the other activities. They were able to see me as more than just their Officer, or pastor but as an ally, a friend, someone who was walking alongside them during this once in a lifetime experience. I was able to have meals with them and get so much one on one time with each of them that I normally would not be able to get at the center. Once we returned, I was able to help them take all they had learned and experienced at camp and apply it to their everyday life, so that it wasnâ&#x20AC;&#x2122;t just a moment or memory, but it was an opportunity to continue to grow mentally and spiritually. Never in my life have I experienced camp in such a way. The bridge between what we do here at the corps community center and what is done at camp became so much more clearer after this experience, and added such a dimension to the holistic approach we are taking with helping our kids live a full life. Sometimes what happens at camp is so disconnected from our kids everyday life, that they think of it as something they can only have at camp, but having both myself and the staff from our center who they see and interact with daily be present allowed them to learn that they can continue all they experienced at camp when they return home. The growth I saw between my coworkers and I was the strengthen of our communication skills. The week at camp helped us improve our communication skills and being able to share our ideas, but not only for camprelated activities, but for the well-being of all of our campers and students. As a staff, we were able to have the opportunity to know each other a lot more and it helped bring us closer and become more of a family. Seeing our kids enjoy camp and learning about God was great. The atmosphere at camp helped them disconnect from their every day life and really let go and let God in. family services component, a licensed daycare center, chapel and the youth center. The youth center offers tutoring in math, reading and writing; computer education, instruction in the arts (visual arts, dance); and sports, including basketball and soccer leagues. Additionally, the facility features a library, computer lab with 30 terminals, classrooms, gymnasium, fitness center, and an art studio. JOIN OUR CAMPFIRE NEWSLETTER TEAM! Use your creative and editorial skills to help us publish the next issue of CAMPFIRE! Weâ&#x20AC;&#x2122;re looking for graphic designers, writers, editors, photographers, and videographers. WHEN DUTY CALLS WE UNITE On the morning of October 27, 2017, the camp staff woke up to a fire at camp by Camp Mt. Crags archery range at the far end of camp. Unsure of how the fire started, the camp staff quickly begin to put the fire out as they await the arrival of the firefighters. No buildings were harmed and everyone was safe. After the collective effort in putting the fire out, the camp staff, Firefighters, and the Police, had an opportunity to have a meal together prepared by our camp kitchen staff. We are truly blessed to be surrounded by a community who cares about camp. I always wanted to work at camp to help different kids from my community build a stronger relationship with Jesus Christ. In the summer of 2016, I had the pleasure of being a blessing not only the kids but to the staff members as well. Making the transition from a wilderness camper to a staff member was a cool experience because I was able to work with friends and former cabin leaders. The Salvation Army camp is a place where you can be yourself and not feel judgment of your peers. It feels good when campers want to come back because you made an impact on their lives and their faith in Jesus Christ. From the songs that uplift you to Jesus Christ, to the nightly devotions, it all helped me with my own walk with Christ. Whenever I think about the summer, I think of Camp Mt. Crags and Camp Gilmore because both camps gave me a push in life and let me know that God will be with me every step of the way. “Be strong and of good courage, do not fear nor be afraid of them; for the Lord your God, He is the One who goes with you. He will not leave you nor forsake you.” (Deuteronomy 31:6). Every year we travel around the world to recruit the best camp staff for the summer. And every summer our camp staff have the opportunity to experience the life changing work of campers and one another. The majestic beauty of camp is not all that it has to offer, but the majestic impact it has on the lives that experience camp. We are blessed to have summer staff that finds joy in the transformation of camper’s lives. And in turn, witnessing such change, transforms our camp staff’s lives. When I began working at Camp Mt. Crags, I expected to be the Cabin Leader that every kid looked up to, but I’ll never forget one camper I had; she blew me away with the intensity of her pursuit of Christ. (I look up to her). She surprised me with the strength of her emotions; she was angry and furious, but when she loved, she loved fiercely and when she forgave, she did so completely. Knowing this, I wasn’t surprised when she told me she wanted to write and sing a song in Friday’s talent show. I knew there was something she needed to express, so I encouraged her. She wrote and re-wrote her song countless times in the days leading up to Friday. When it was time for the show, she performed beautifully and delivered a poetic message about the strength and trustworthiness of God, inspired by a miracle she witnessed in her grandmother’s life. I was humbled to hear the unquestioning faith and see the courage of this 10-year-old, and I continue to be inspired by her to this day. ‘’The wings of transformation are born of patience and struggle’’ - Anonymous. All my life it has always been tough to express myself and really be comfortable with people, especially people with different personalities from mine. I always wondered why I felt so disconnected and isolated. That soon changed when I started attending The Salvation Army Camp almost every summer. I started going to camp at the age of eight or nine years old. I remember singing in chapel, sitting by the fire every night, and receiving somewhat of a relationship with the Lord. At that time I didn’t understand how the power of God can uplift you. It was very beneficial for me to experience such love from God, my cabin buddies and the incredible staff. Going to camp at a very young age inspired me to work there. My Cabin Leader at the time, Sarah, informed me about the Timothy program. I decided to sign up, but I didn’t get the job, until the following year. Working there and being a camper is totally different. I was mentally, physically, emotionally, and spiritually challenged. I’m glad I was challenged because it opened my eyes to a lot of things I didn’t know about myself. I learned that I’m patient, hardworking, and willing to listen to others. My experience at camp transformed me into a beautiful young woman. Camp Director at The Salvation Army Mt. Crags, Gilmore, and Wilderness Camp & Conference Center. There are so many people that have been blessed by this place. This includes previous campers, staff members, and many of our guest groups. We want to reignite your passion and memories that were formed at these sacred grounds. It is our hope that, as you read ‘The Campfire’, you will be brought back to a place that has such a life changing impact on your life. Thank you for your continued support and prayers for camp. Over the last 5 years God has continued to do great things at our camp. We want to highlight some of the great things that have happened here at camp. We look forward to connecting with you at the Campfire. Marty Brown & his wife Heather oversee the daily operations of all three camps year-round. They are raising 5 beautiful children: Joshua, Lucas, Lily, and twins, Elijah & Ellie. CAMPFIRE is the heart of our togetherness. It is a gathering place where we as one Christ-centered family unite in fellowship, worship, and celebration. CAMPFIRE embodies our connection to one another and will continue to be the hub of our connection. We hope that as you encounter the testimonials of alumni campers and staff, that you will be inspired by the transformative power that the ministry of camp has had on the lives of our campers and staff. As for myself, I grew up as a camper attending Camp Mt. Crags and Gilmore every summer as a young girl. Today, I am the CEO of my own consulting company and serve on the Camp Advisory Council. In the coming issues of camp, it would be an honor and privilege to share with you my life changing experience as a camper and staff. Our hope is that as you encounter The Campfire, you will remember your own life changing experience at camp and share your story. Camp remains to be a special place for many of us and we invite you to join us in keeping camp a ministry that will continue to make an impact in our campers and staff lives. One thing that remains and never ceases to change here, is God’s presence surrounding this glorious campground. May the Lord be with you while we are absent one from another. Special thanks to our territorial, divisional, and local camp leadership. Your support and commitment to the mission of The Salvation Army and our camp programs have made an immense impact on the lives of those we serve and care for. 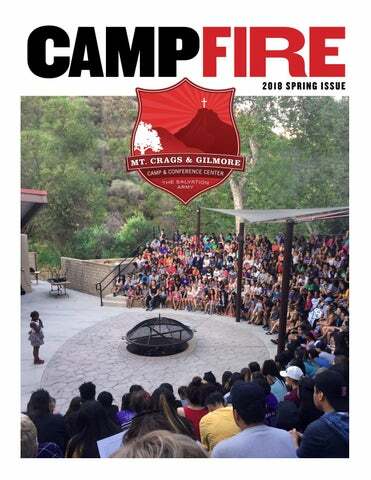 Territorial Commander of USA Western Territory CAMPFIRE is a publication of The Salvation Army Southern California Division Camp Advisory Council. 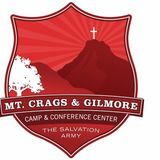 THE SALVATION ARMY CAMP MT.CRAGS/GILMORE/WILDERNESS 24601 DOROTHY DRIVE CALABASAS, CA 91302 Visit us at campmtcrags.org. May the Lord watch between me and thee, while we are absent one from another.